Some of you may remember this post from last summer (I highly encourage you to click on the link, the pictures below will seem much more impressive). Well, it's been almost a year since I started work on the downstairs bathroom and I'm almost done! 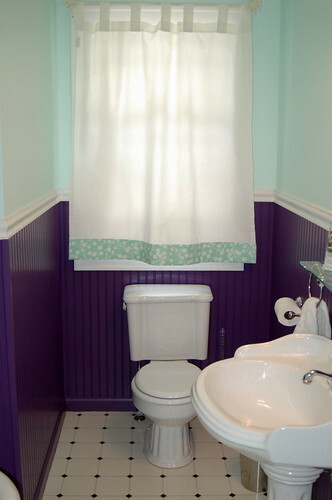 After 4-5 coats of paint, I needed to find both a regular curtain and a shower curtain to coordinate with the new colors. I went back and forth on what I wanted and then decided to just make something myself. The curtain was quite easy. I just modified the curtain we already had by adding a strip of coordinating fabric to the bottom. The shower curtain was a little more difficult. I decided I wanted to do an appliqued monogram of sorts. I thought a lower case "e" was perfect - not too pretentious, and to make it more interesting I decided to play around with proportion of a lower case letter. I printed out the "e" that I wanted and then went to Kinko's. Below is the result of an 800% enlargement. I then used this big "e" as a pattern to cut out the fabric for applique. I tried to use a new fusible web for applique because the standard Steam 'n Seam was just too small, but I was sorely disappointed in the Heat n Bond Lite that I bought at Joanns. I would never recommend using this product for any project - it just won't hold it's bond, which made the applique process very interesting . . . Needless to say I finished the shower curtain and am proud to present the finished result. Although it's not perfect, it's definitely better than the bright yellow-rubber ducky theme that we had before. The colors may be bold, but it looks like us, and it will suffice until we decide to give that bathroom a real over-haul. It's just too bad it took almost a year to get there! Ummm, just a year to complete! That's not bad at all. We are approaching the 4 year mark on our master bathroom. Dry wall is almost complete! Maybe it will be finished in another 2 years!